This weekend was all about flea markets, or antique stores, or consignment shops, whatever you choose to call them. We went to three yesterday, and hit two more new ones today that we’d never been to before. I was in search of some small trinkets for a new art project I’m planning to start soon. I came across some neat ideas on Pinterest a while ago, yes Pinterest! But I knew I’d have to do some serious searching to find the things I needed to pull it off. Well, after 5 antique stores this weekend, I found plenty to get me started. I’m not going to tell you what it is I’m up to just yet. 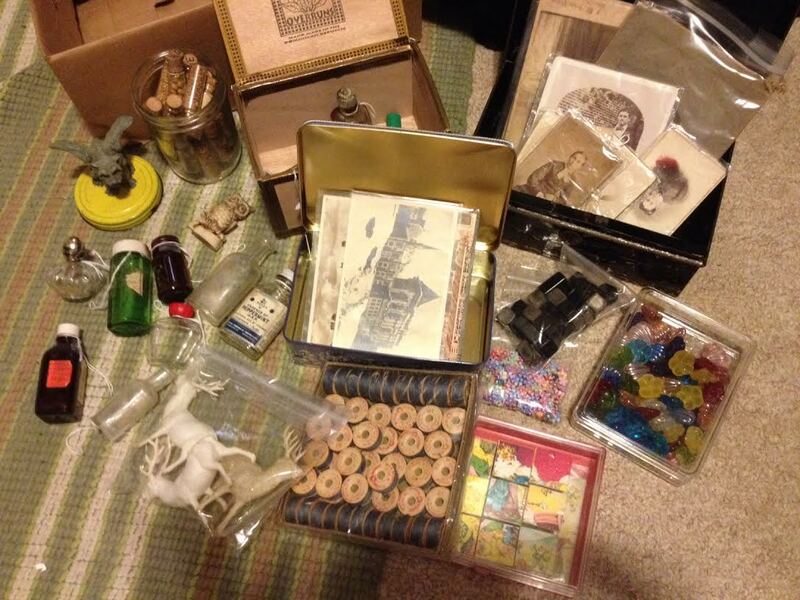 You’ll have to take a guess based on the picture above which is of all the loot I came home with…two tins, a cigar box, lots of old photos and postcards, beads, gems, thread, bottles, and trinkets. Like I said, I’m not telling….not yet anyway. I also enjoyed looking at all the other cool, funky stuff and snapped some photos to share. I did buy this photo! Yes, that’s a real bat. I had a monkey like this as a child. Almost bought it! This whole array of stuff made me laugh. A hint at what my project is.